With the joys of parenthood come plenty of small and sometimes large disappointments. All that stuff we’re not bragging about in the annual Christmas letter and are definitely not posting on Facebook. The defeats we quietly absorb, agonize over with a spouse, or maybe vent about to a close friend. The not-so-good call from the teacher. The sneaking out at night. The first time a teenager comes home with alcohol on his breath. Kids will be kids. Sure. However, life would be so much easier if my offspring listened to me with precision and complete obedience (ha!). Despite the tough part of parenting, I have specific hopes and dreams for my kids. Many of them steeped in my passions and pursuits. For one, I imagined my children would be book lovers as I am. 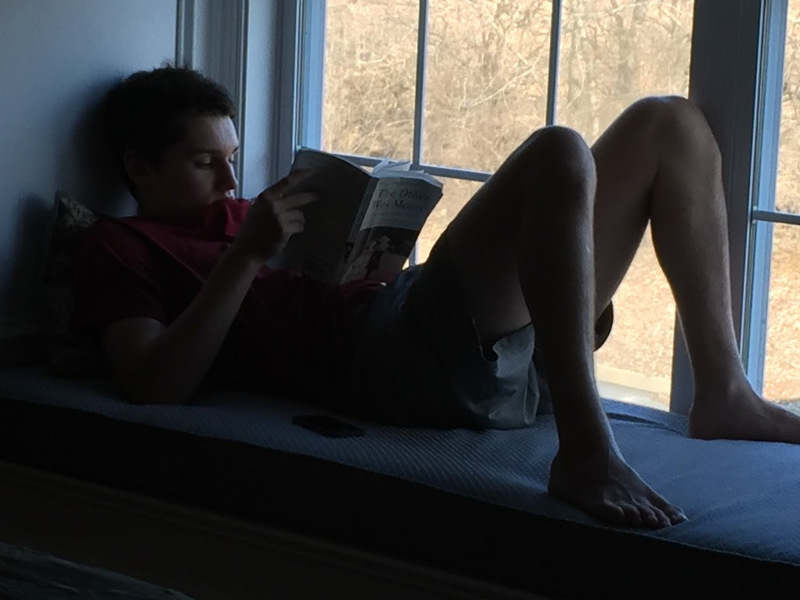 While my daughter reads school-required novels and Young Adult bestsellers (think The Fault In Our Stars or Falling Into Place), my son teenage son refuses to read books. This is sad for me. When he was a toddler, my husband and I read to him all the time. He loved the sing-song rhythm of Mother Goose nursery rhymes, always begging for one more story. I had Hush Little Baby and Love You Forever memorized. Things looked promising in pre-school. He had a small friend who was an early reader and they tried to outdo each other with their workbooks and reading prowess. Soon sports entered the picture. As a good athlete, he began to care more about balls and less about books. Luckily, he had Reading as a mandated subject through seventh grade and read (albeit grudgingly) sports-themed books like Mike Lupica’s Million Dollar Throw. Eighth grade marked the beginning of the end. Reading was no longer a required school course and, therefore, it ceased. When not on the soccer or lacrosse field, he spent his time texting, Tweeting, Instagramming, Snapchatting, and hanging out with friends. It was (and still is) impossible to make him pick up a book. I’m afraid he’s missing one of life’s greatest pleasures—the joy of falling into a good novel, the brain stretching, and the way great literature changes the way you see the world. But something happened the other day. It was a normal Saturday just like any other. Dreaded laundry basket in hand, I turned the corner into my bedroom and almost collapsed from shock. There he was sprawled on the window seat, reading a book! Just like in my fantasies. I caught my son in the act. I was tempted to post a picture on Facebook. After a quick interrogation, it was revealed that his English teacher had forced him complete an interests’ questionnaire and, subsequently, matched him with a book (that didn’t have Cliff Notes).
. It’s a true story about two kids, both with the name Wes Moore, who come of age on the tough streets of Baltimore. One becomes a Rhodes scholar and the other a convicted felon now serving life in prison. At this point, I’ve written to both his English teacher and to the author Wes Moore thanking them for this miraculous development. My dreams are not dead.